It's finally soup weather! I love soups, but I'm always intimidated make them. I feel like lots of recipes list 20+ ingredients or require simmering in the crock pot all day. A friend and I decided to make dinner together and she recommended this soup. It was surprisingly easy and totally delicious! 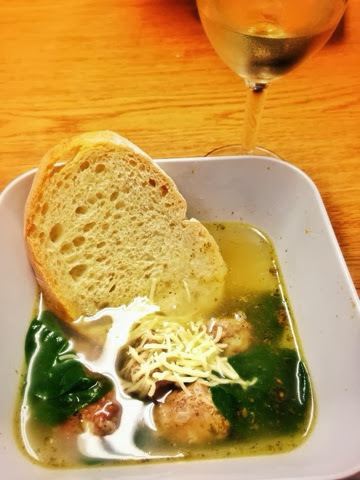 I believe that soup is good for the soul and this simple soup (inspired by Giada) will save you some time and stress too! 1. Preheat the oven to 350 degrees. In a large bowl mix the onion, parsley, garlic, salt, bread pieces, beef, cheese, and pepper. Shape into small meatballs (1 in diameter). Put on a baking sheet. Place in the oven. Bake for 20-25 minutes. 2. In a large pot, add in the chicken broth and bring to a boil. Add in the baby spinach and cover to let it wilt. Once the meatballs are done, add them into the soup. Add in 2 T Italian seasoning and season with salt and pepper to taste. 3. Serve with bread and topped with grated parmesan. So simple and delicious! You can always add more veggies and a small pasta (like orzo) if you want to make it heartier.